Saturday’s Royal Wedding has got everybody talking, and for all the right reasons. I was working on Saturday, but made sure to catch whatever glimpses of it I could. I absolutely loved Meghan (or should I say HRH Duchess of Sussex’s?) look. That trademark messy bun given a sophisticated edge, and the fresh and fashion-forward makeup is right up my street. I thought she looked absolutely stunning! Designing bridal looks for my clients is one of my favourite parts of my job, and each one is as unique as the woman who will be wearing it. 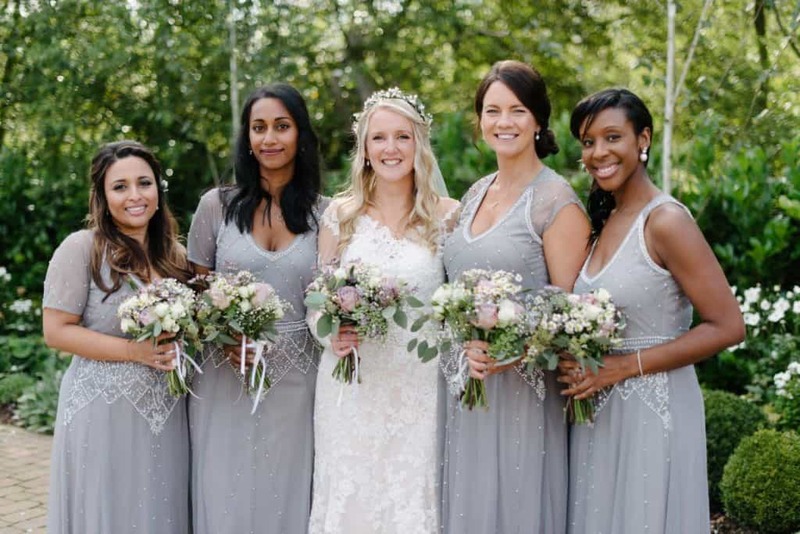 As everyone reflects on Ms Markle’s wedding glow, I thought I would share some of my favourite bridal looks from previous clients, and the stories behind them. I first met Gemma when she was a bridesmaid at her sister’s wedding. 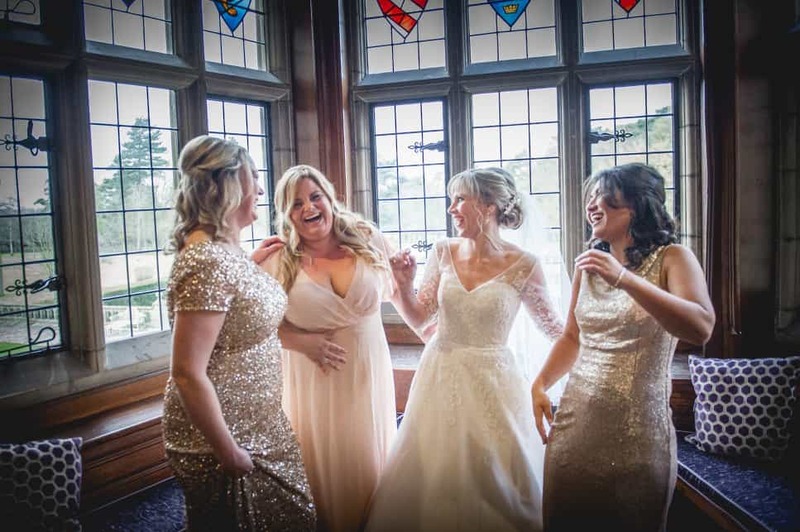 I worked on the whole bridal party there, so it was lovely to see an enquiry from Gemma pop up few years later when she was getting married herself. Gemma’s vision for her wedding-day look was pure celebrity glamour. I used a darker, slightly smoky eye paired with a pale pink lip, and added a soft wave to her hair for a relaxed and modern half-up, half-down look. 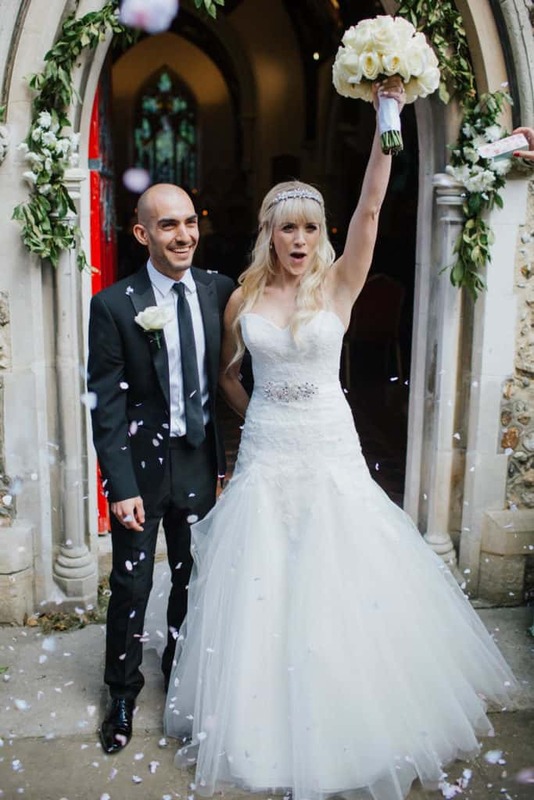 I love her cool, confident and glamorous bridal style; Gemma didn’t just walk down the aisle – she rocked it! Getting to share in the morning of someone’s wedding day is always a special experience, but when I’m lucky enough to work with a bride as positive, open and glowing as Amanda is it’s even better. I had such fun with her and her bridesmaids. She’s a multitalented lady who has been on the West End stage, and there was so much music and laughter as she got ready for her big day – at one point she even gave us some hilarious rap stylings! 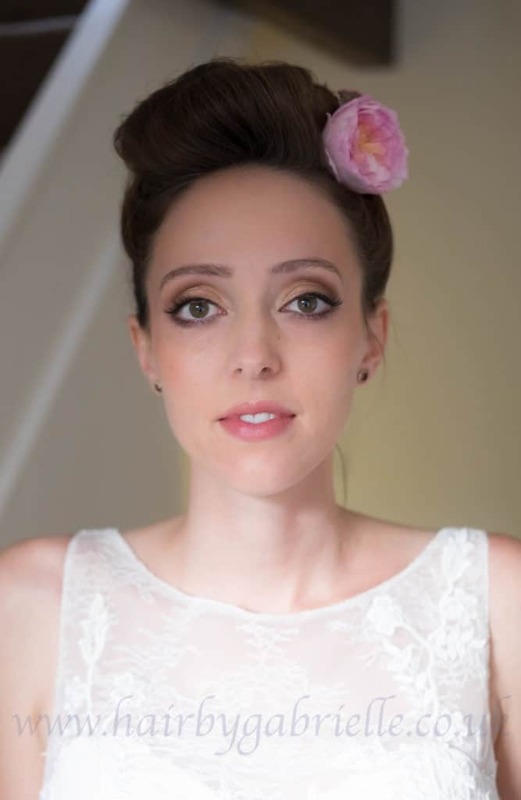 She wanted romantic elegance for her wedding look – a soft updo with some tendrils framing her face, and a fresh, natural makeup look with an emphasis on her gorgeous eyes. She looked absolutely beautiful for her wedding at Fanham’s Hall in Ware, Hertfordshire. I’ll bet her big day was wonderfully fun from start to finish! Sitha is hugely special to me. 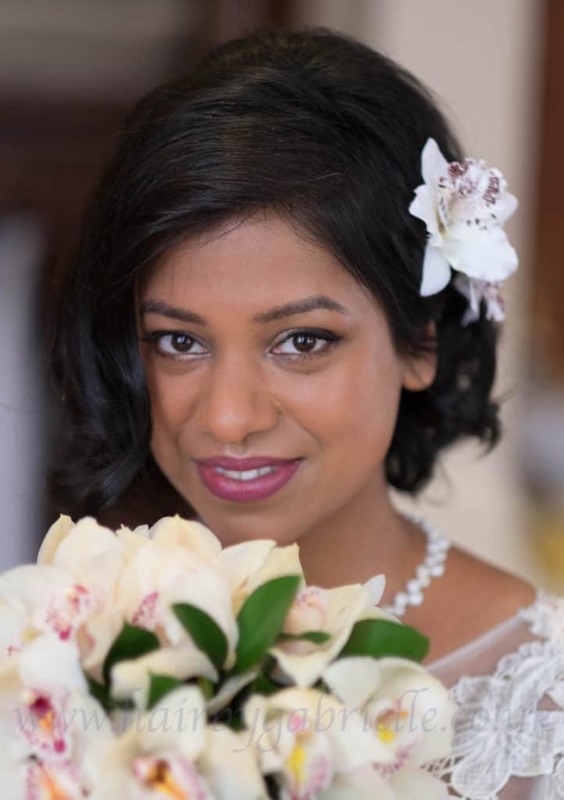 At her trial, she came to me feeling really anxious about her wedding day, and concerned that she wouldn’t look or feel like a beautiful bride. Her hair is extremely thin, and she struggles to find styles for it, and her nerves about how she would look were taking some of the excitement out of the run up to her wedding day. I worked hard to reassure her, and set about creating a look that would give some real body and volume to her hair. I asked her not to look in the mirror during the trial, so that she could get a real sense of a reveal and a ‘before and after’ moment. I’ll admit, I was nervous as I asked her to look at her reflection for the first time, but she cried with happiness. 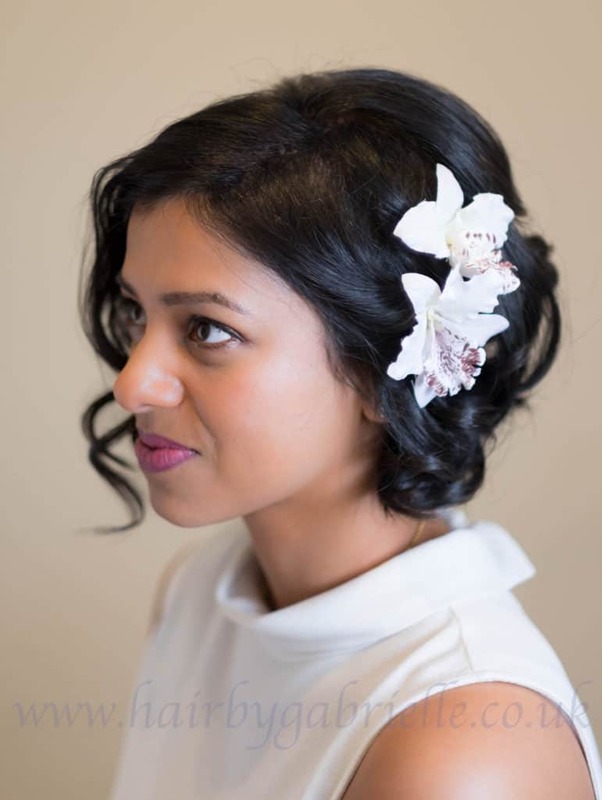 She hugged me with such gratitude at the end of the trial, and I loved recreating this look for her on her wedding day, complete with orchids in her hair. Doesn’t she look stunning? 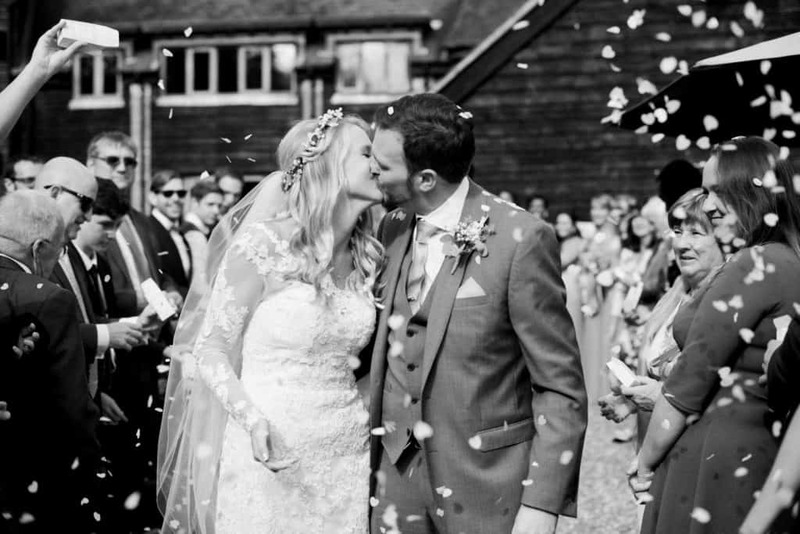 Clare got married at Tewin Bury Farm Hotel in Hertfordshire, which is a beautifully rustic and bohemian venue. She wanted a look that would complement the style of her rural venue choice, and she knew that she wanted to wear flowers in her hair. This was music to my ears as I LOVE to work with flowers. We worked together to design a look that was young, fresh and relaxed. 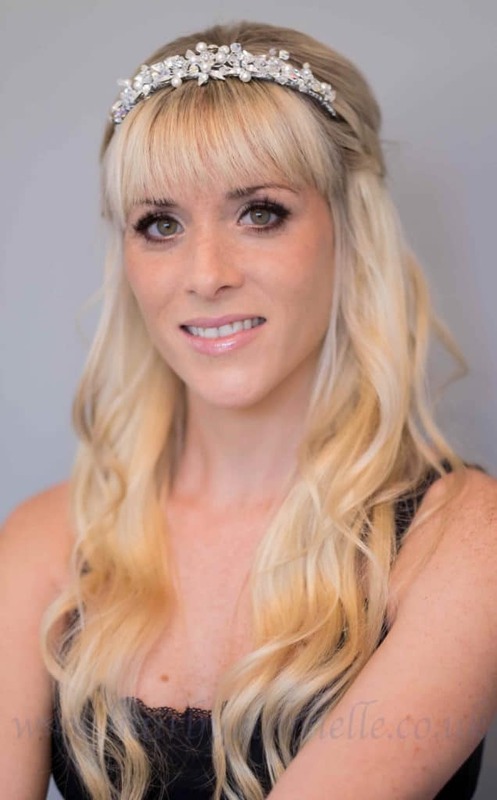 Clare was nervous that her eyes might appear sunken in her photographs, so I used eyeshadows with warm gold and peach tones to help them stand out and bring out their natural sparkle. I love it when a bride comes to me wanting something a little different. Amanda had chosen a classically elegant wedding gown, but she wanted to pair this with an edgy, Mohawk-inspired up do. Cue a lot of happy dancing from me! 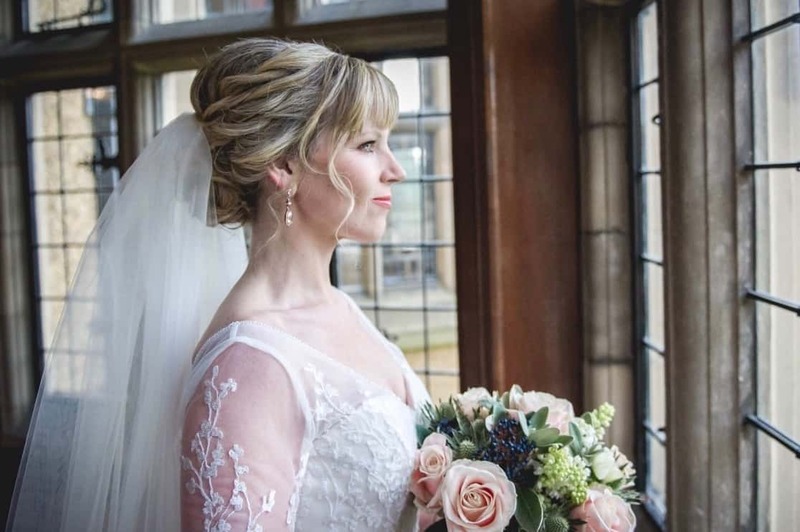 I incorporated flowers from her bouquet into the style as a focus point, and I just love the contrast of the strong, contemporary sweep of the hairstyle with the delicate lace of the dress. For her makeup look, I used a dewy and fresh base, with darker golds and browns to create a smoky eye that was still wedding-appropriate. I am a bit in love with this look, and Amanda carried it off to perfection. 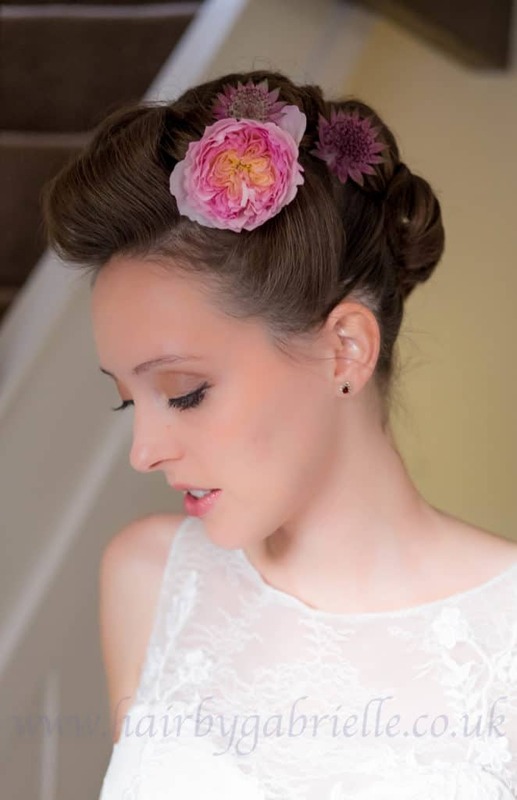 If you’re looking for an experienced, professional and friendly hair and makeup artist for your wedding day, why not get in touch? I’d love to hear from you and find out about your plans for the big day.